As a British soldier, you are far more disciplined and experienced in battle than the rag-tag militia. Here at Guilford Courthouse your troops are outnumbered by more than two to one, but hunger and exhaustion seem greater enemies. This is foreign soil and hundreds of miles away from resupply and reinforcement. A battalion of British Guards sweeps across this ground from right to left to assault the American third line. 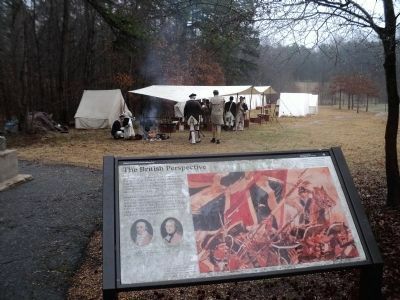 By this stage in the fighting, the Guards have momentum but their ranks have been thinned, While Continentals, the Americans’ toughest troops, hold the high ground, the British soldiers are professionals and step forward with grim confidence. The small monument in the middle of the field commemorates the death of a talented officer, Lt. Col. James Stewart of the Second Foot Guards. An encampment of the NJ Light Infantry can be seen behind the marker. when traveling west. Touch for map. 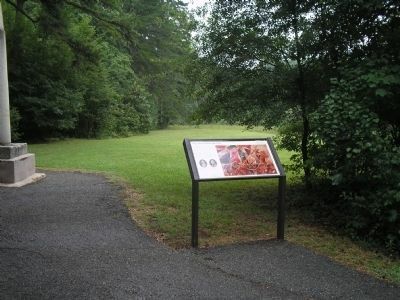 Marker is in Guilford Courthouse National Military Park, on the Auto Tour at stop 7. Marker is in this post office area: Greensboro NC 27410, United States of America. Touch for directions. Other nearby markers. At least 8 other markers are within walking distance of this marker. Regulars’ Monument (here, next to this marker); 1st Virginia Cavalry (within shouting distance of this marker); Hon. Lieut. Colonel Stuart (about 300 feet away, measured in a direct line); Death of Stewart (about 500 feet away); Maryland Monument (about 600 feet away); Delaware Monument (about 600 feet away); Delaware Continentals (about 700 feet away); Peter Francisco / Marquis of Bretigny and Col. Wm. Washington (approx. 0.2 miles away). Touch for a list and map of all markers in Greensboro. 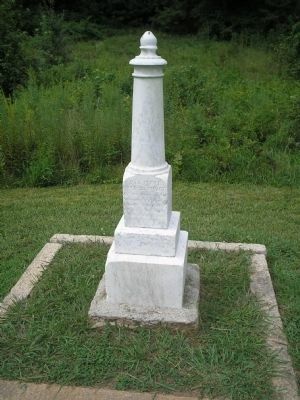 The Regulars’ Monument can be seen in this photo behind the marker. 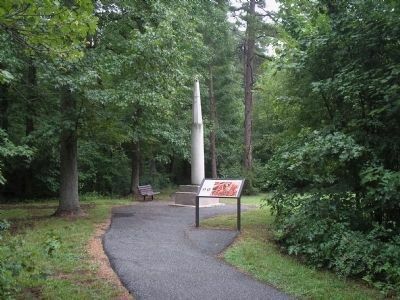 This simple shaft honors the regulars who fought in the Battle of Guilford Courthouse. 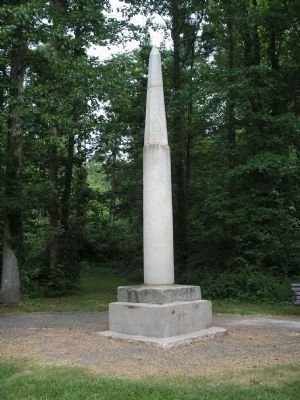 It is located near the marker, along a short walking trail at tour stop 7. This monument honors Lt. Col. James Stewart of the Second Foot Guards. It is located on the Historic New Garden Road trace near the marker. The inscription reads: "Hon. Lieut. 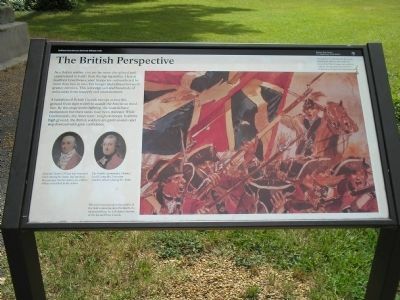 Colonel Stuart of the Second Batallion of the Queen's Guards, was killed at this spot by Captain John Smith of the First Maryland Regiment." More. Search the internet for The British Perspective. Credits. This page was last revised on June 16, 2016. This page originally submitted on September 18, 2008, by Bill Coughlin of North Arlington, New Jersey. This page has been viewed 933 times since then and 5 times this year. Photos: 1. submitted on September 18, 2008, by Bill Coughlin of North Arlington, New Jersey. 2. submitted on March 17, 2015, by Bill Coughlin of North Arlington, New Jersey. 3, 4. submitted on August 1, 2010, by Bill Coughlin of North Arlington, New Jersey. 5, 6. submitted on September 18, 2008, by Bill Coughlin of North Arlington, New Jersey.